Beginning 17 miles west of Yakima at an intersection with US-12, the seasonal Chinook Pass Highway (SR-410) ascends northwest, then west, following the Naches, Bumping, and American Rivers to beautiful Chinook Pass, an eastern access to Mount Rainier National Park. The highway is closed for the winter about five miles below the pass (from November through May in an average year). The full altitudinal range of Eastside habitats from Garry Oak and upper shrub-steppe to lower subalpine is present along this route and its many side branches, although lakes and marshes are in relatively short supply. Nile Road turns off left from SR-410 in 8.0 miles. In 1.4 miles, turn left from Nile Road onto Bethel Ridge Road (FR-1500), then left again in 1.0 mile onto Little Rattlesnake Road (FR-1501), which follows Little Rattlesnake Creek for the next 5.2 miles to a junction with FR-1503. Pacific-slope Flycatcher, Warbling Vireo, Veery, MacGillivray’s and Yellow Warblers, and other riparian species are common along this stretch. At the junction, keep right onto FR-1503. A marsh-rimmed lake in 1.5 miles has many more birds of riparian and montane-forest habitats. Return to Nile Road and turn left to a bridge over the Naches River (3.3 miles). Streamside vegetation and marsh along the road have many birds, including Black-chinned and Rufous Hummingbirds, Red-naped Sapsucker, Willow and Pacific-slope Flycatchers, Warbling Vireo, Black-capped Chickadee, House Wren, Veery, Gray Catbird, Cedar Waxwing, MacGillivray’s and Yellow Warblers, Song Sparrow, Black-headed Grosbeak, Purple Finch, and Evening Grosbeak. Nile Road rejoins SR-410 in another 0.2 mile. Turn left toward Chinook Pass. 1.6 miles and turn right onto FR-1711. In another 0.8 mile, stop to listen for the owl. Good habitat for Flams continues for another quarter-mile. Several miles farther on, the forest opens up with large patches of Bitterbrush, good for Common Poorwill. For good daytime birding in open Ponderosa Pine and Douglas-fir forests at the head of the Wenas Creek drainage, return to FR-1701, turn right and travel uphill on FR-1701. Turn right in 2.2 miles onto FR-1712, go 0.1 mile, and bear left onto FR-1713. Rocky Prairie (elevation 3,800 feet) starts in 0.5 mile. Look here for White-headed Woodpecker, White-breasted and Pygmy Nuthatches, Western and Mountain Bluebirds, Townsend’s Solitaire, and Cassin’s Finch. To reach Canteen Flats (elevation 4,400 feet), return to FR-1701 and continue three miles past the FR-1712 turnoff. The rocky meadows rimmed by open forest have birds similar to those of Rocky Prairie. A short spur road (FR-524; now closed to vehicular traffic, but you may walk it) descends eastward from Canteen Flats to a trailhead for Yellowjacket Creek. From here you may follow along Yellowjacket Creek and Dry Creek to Wenas Campground (hike described on page 296). Several miles farther north on FR-1701, wetter forests of Grand Fir and Western Larch are good for Williamson’s Sapsucker, Hammond’s Flycatcher, Ruby-crowned Kinglet, and MacGillivray’s and Townsend’s Warblers. Nine-tenths of a mile farther up SR-410, a second road (FR-1702) turns off right and ascends Rock Creek. Begin checking for Flammulated Owls about five miles up, on a sidehill where Douglas-fir, Ponderosa Pine, and an undergrowth of Deerbrush and other shrubs make for a high density of moths, the owls’ preferred food. In April, this area is good for Great Horned and Northern Saw-whet Owls. Continue west along SR-410. In 5.4 miles, pull completely off the road opposite Edgar Rock, which towers above you across the Naches River. Turkey Vulture, Red-tailed Hawk, Peregrine Falcon, and numerous Violet-green Swallows may be seen overhead, while the riparian woodland by the roadside has Warbling Vireo, Veery, and Yellow Warbler. Cliffdell, in another 0.8 mile, offers the last reliable service station for 80 miles. In 3.4 miles you reach FR-1708, a good owling road that leads to Milk Pond. Go two miles up the road to a ravine. By walking about 500 yards up this forested gulch, then ascending a slope to the left for another few hundred yards, you might encounter Northern Saw-whet or other owls. Hammond’s Flycatcher, Hermit Thrush, Townsend’s Warbler, and Evening Grosbeak are common in these woods. West again on SR-410, find FR-19, the Little Naches Road, on the right (0.7 mile). Near this corner the Bumping River and the Little Naches River unite to form the Naches River. The large Little Naches watershed—heavily clearcut in recent decades—now consists of a mosaic of meadows, gallery riparian woodland, and fir forests, favorable to Barred Owls, which have invaded the area. Stopping along the road at dawn or dusk, especially near openings in the forest, will often turn up one. The historic Naches Trail—a wagon road to Puget Sound used by early settlers—followed the Little Naches River up across Naches Pass, then down the Greenwater and White River drainages on the Westside. FR-19, FR-1914, and FR-70 approximate its route. The actual pass, however, is now crossed by a deeply eroded, seven-mile jeep track. Despite the devastation from no-holds-barred logging and ATV traffic, patches of original forest in the wide vicinity of the 4,900-foot pass still harbor American Three-toed Woodpecker, Gray Jay, Ruby-crowned Kinglet, and other montane specialties. White-crowned Sparrow (gambelii) breeds at the pass, and there are even fall reports of Boreal Owl. Keen birders occasionally venture here to find Eastside species such as Calliope Hummingbird, Red-naped Sapsucker, Dusky Flycatcher, Mountain Bluebird, and Cassin’s Finch at their western range limits. Government Meadows, a mile west of the summit, is generally a productive spot. 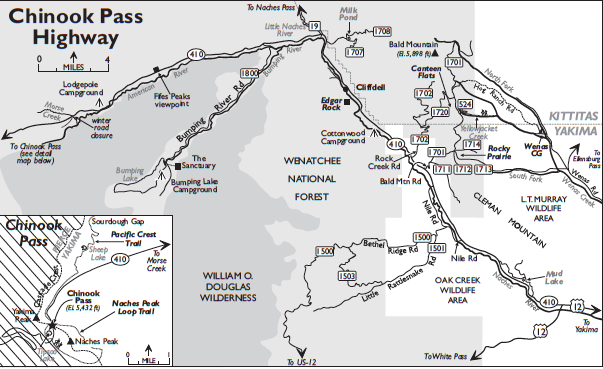 Before setting out to explore this area, make sure you have up-to-date maps and road information and an America the Beautiful or Northwest Forest Pass. All of these are available at the USFS ranger district stations on SR-410 in Naches and Enumclaw. Continue west on SR-410 from the Little Naches Road intersection. In 3.7 miles, turn off left onto the Bumping River Road (FR-1800). Lands on both sides of the narrow valley corridor are protected in the William O. Douglas Wilderness, named for the late Supreme Court justice and noted conservationist, who made this area his second home. Look for Northern Goshawk and Pileated Woodpecker in the beautiful, mostly unlogged forest that lines the road, although the goshawk is remarkably elusive in the breeding season. Stop off the highway in 6.5 miles to explore a meadow by the river. Spotted Sandpiper and American Dipper are expected here, while Vaux’s Swifts zip by overhead. In another 4.6 miles you reach the dam for Bumping Lake, a reservoir with nesting Barrow’s Goldeneye, Osprey, and Spotted Sandpiper. The picnic area at Bumping Lake Campground (USFS fee area), in 0.2 mile, provides an overlook of the lake. At the dam, go east from FR-1800 onto an unmarked, sandy, but passable track. Follow the main track through thick Lodgepole Pine woods to its end (0.6 mile). Walk a hundred yards to The Sanctuary, a small grove of huge Western Redcedars forming a Westside-type forest—great for Barred Owl, Chestnut-backed Chickadee, and Varied Thrush. Put your identification skills to work sorting out the two species of pine, three true firs, a spruce, two hemlocks, two cedars, Western Larch, and Douglas-fir that occur here, along with Red Alder—almost exclusively a Westside tree. From the Bumping River Road intersection, SR-410 follows the American River westward the rest of the way to Chinook Pass. Stop at the Fifes Peaks Viewpoint (7.0 miles). The forest here is quite moist, reflecting proximity to the Cascade Crest. Hammond’s Flycatcher, Chestnut-backed Chickadee, Hermit and Varied Thrushes, and Townsend’s Warbler are all common. Spy on the volcanic spires of the Fifes Peaks towering above; you may see a band of Mountain Goats. Stop again at Lodgepole Campground (4.8 miles). Williamson’s Sapsucker is often found in the forest here—a mixture of Lodgepole Pine and Western Larch. The highway is closed for the winter at Morse Creek (2.0 miles). Near the winter-closure gate, a track leaves the highway on the left (downhill) side. Forest along this track has been a reliable spot to find Barred Owl and Chestnut-backed Chickadee, while the slopes on the right (uphill) side of the highway are excellent for Sooty Grouse. It is 5.4 miles from Morse Creek to Chinook Pass (elevation 5,432 feet), in the subalpine along the eastern boundary of Mount Rainier National Park. Views of the mountain are superb, especially in early morning. The forest here is composed of Mountain Hemlock and spire-like Subalpine Fir, alternating with lush meadows (best flower display from mid-July through mid-August). Gray Jays and Clark’s Nutcrackers panhandle shamelessly among the throngs of visitors. Sooty Grouse frequent the meadow edges. Migrant flycatchers, vireos, warblers, and sparrows can be numerous in the thickets in fall. In early evening, watch for a small flight of Black Swifts heading back to their nesting cliffs, presumably in the park. A modest showing of raptors appears over the ridges beginning in late August and continuing through mid-October. Trails at the pass offer fine birding but are not fully open until the snow melts—usually by late July. The four-mile Naches Peak Loop is on the south side of the highway. Look for Mountain and Chestnut-backed Chickadees, Red-breasted Nuthatch, Pacific Wren, Townsend’s Solitaire, Hermit and Varied Thrushes, American Pipit, Yellow-rumped and Townsend’s Warblers, Chipping and Fox Sparrows, Pine Grosbeak (uncommon), Cassin’s Finch, and Red and White-winged (irregular) Crossbills. North from the pass, a two-mile trail leads to Sheep Lake, and in another mile to Sourdough Gap (elevation 6,400 feet). This trail opens earlier in summer than the Naches Peak Loop as it traverses a south-facing slope for the first 1.5 mile. Brushier patches on this initial stretch make for great habitat for migrating warblers and sparrows beginning in August. Both trails can be good for raptors from mid-August through October.